Our arms laid down, in all their humility – grounded. Confidence forced off the bench. As behind the flag is man with a sharp object. The fight is not lost, just paused. Ntsika Tyatya is a writer, poet, spoken word performer who is from Nelson Mandela Bay, he has been active in the poetry scene for the past 12 years. After co-producing weekly poetry sessions in Port Elizabeth in 2006, he created SLAM ( Student’s Literature and Arts Movement) in 2008, which was the first slam poetry society at Cape Peninsula University of Technology. He was the headliner and finalist in the Cape Town poets search competition, Poetry Delight, as well as a headliner at the East London weekly poetry sessions; Brute Force. 2012 he was one of the headlining poets at the National Book Week. 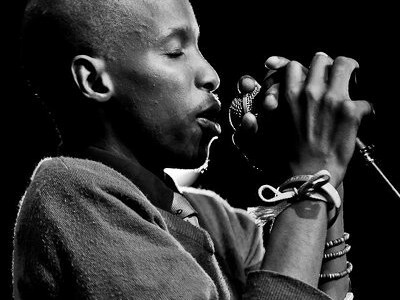 He has graced the stages with Luka Lesson (AUS), Lesego Rampolokeng, Lebo Mashile, Ntsiki Mazwai, Bongeziwe Mabandla, Don Mattera, Afurakhan, The Brother Moves on, Zubz, Mxo, Tumi to name few. In 2014 he partnered with Word and Sound, as the Eastern Cape facilitator in their Slam Your Life national competition that was held in Grahamstown. He currently pursues a BA in Corporate Communication and has assisted with conceptualising both Maxhosa exhibitions in 2013 and 2014. He was part of the company that assisted in bringing Ian Kamau (Canada), Tutu Puoane (Holland) Vatiswa Ndara (SA), to Nelson Mandela Bay. He freelances in communication for various artists and businesses.